This article is about disturbances within Earth's magnetosphere. For other uses of "magnetic storm", see Magnetic storm (disambiguation). Not to be confused with geo-storm or solar storm. Artist's depiction of solar wind particles interacting with Earth's magnetosphere. Sizes are not to scale. A geomagnetic storm (commonly referred to as a solar storm) is a temporary disturbance of the Earth's magnetosphere caused by a solar wind shock wave and/or cloud of magnetic field that interacts with the Earth's magnetic field. The increase in the solar wind pressure initially compresses the magnetosphere. The solar wind's magnetic field interacts with the Earth's magnetic field and transfers an increased energy into the magnetosphere. Both interactions cause an increase in plasma movement through the magnetosphere (driven by increased electric fields inside the magnetosphere) and an increase in electric current in the magnetosphere and ionosphere. During the main phase of a geomagnetic storm, electric current in the magnetosphere creates a magnetic force that pushes out the boundary between the magnetosphere and the solar wind. The disturbance in the interplanetary medium that drives the storm may be due to a solar coronal mass ejection (CME) or a high speed stream (co-rotating interaction region or CIR) of the solar wind originating from a region of weak magnetic field on the Sun's surface. The frequency of geomagnetic storms increases and decreases with the sunspot cycle. CME driven storms are more common during the maximum of the solar cycle, while CIR driven storms are more common during the minimum of the solar cycle. Several space weather phenomena tend to be associated with or are caused by a geomagnetic storm. These include solar energetic particle (SEP) events, geomagnetically induced currents (GIC), ionospheric disturbances that cause radio and radar scintillation, disruption of navigation by magnetic compass and auroral displays at much lower latitudes than normal. In 1989, a geomagnetic storm energized ground induced currents that disrupted electric power distribution throughout most of the province of Quebec and caused aurorae as far south as Texas. In 1931, Sydney Chapman and Vincenzo C. A. Ferraro wrote an article, A New Theory of Magnetic Storms, that sought to explain the phenomenon. They argued that whenever the Sun emits a solar flare it also emits a plasma cloud, now known as a coronal mass ejection. They postulated that this plasma travels at a velocity such that it reaches Earth within 113 days, though we now know this journey takes 1 to 5 days. They wrote that the cloud then compresses the Earth's magnetic field and thus increases this field at the Earth's surface. Chapman and Ferraro's work drew on that of, among others, Kristian Birkeland, who had used recently discovered cathode ray tubes to show that the rays were deflected towards the poles of a magnetic sphere. He theorised that a similar phenomenon was responsible for auroras, explaining why they are more frequent in polar regions. A geomagnetic storm is defined by changes in the Dst (disturbance – storm time) index. The Dst index estimates the globally averaged change of the horizontal component of the Earth's magnetic field at the magnetic equator based on measurements from a few magnetometer stations. Dst is computed once per hour and reported in near-real-time. During quiet times, Dst is between +20 and −20 nano-Tesla (nT). A geomagnetic storm has three phases: initial, main and recovery. The initial phase is characterized by Dst (or its one-minute component SYM-H) increasing by 20 to 50 nT in tens of minutes. The initial phase is also referred to as a storm sudden commencement (SSC). However, not all geomagnetic storms have an initial phase and not all sudden increases in Dst or SYM-H are followed by a geomagnetic storm. The main phase of a geomagnetic storm is defined by Dst decreasing to less than −50 nT. The selection of −50 nT to define a storm is somewhat arbitrary. The minimum value during a storm will be between −50 and approximately −600 nT. The duration of the main phase is typically 2–8 hours. The recovery phase is when Dst changes from its minimum value to its quiet time value. The recovery phase may last as short as 8 hours or as long as 7 days. The size of a geomagnetic storm is classified as moderate (−50 nT > minimum of Dst > −100 nT), intense (−100 nT > minimum Dst > −250 nT) or super-storm (minimum of Dst < −250 nT). The first scientific observation of the effects of a geomagnetic storm occurred early in the 19th century: From May 1806 until June 1807, Alexander von Humboldt recorded the bearing of a magnetic compass in Berlin. On 21 December 1806, he noticed that his compass had become erratic during a bright auroral event. On September 1–2, 1859, the largest recorded geomagnetic storm occurred. From August 28 until September 2, 1859, numerous sunspots and solar flares were observed on the Sun, with the largest flare on September 1. This is referred to as the Solar storm of 1859 or the Carrington Event. It can be assumed that a massive coronal mass ejection (CME) was launched from the Sun and reached the Earth within eighteen hours—a trip that normally takes three to four days. The horizontal field was reduced by 1600 nT as recorded by the Colaba Observatory. It is estimated that Dst would have been approximately −1760 nT. Telegraph wires in both the United States and Europe experienced induced voltage increases (emf), in some cases even delivering shocks to telegraph operators and igniting fires. Aurorae were seen as far south as Hawaii, Mexico, Cuba and Italy—phenomena that are usually only visible in polar regions. Ice cores show evidence that events of similar intensity recur at an average rate of approximately once per 500 years. Since 1859, less severe storms have occurred, notably the aurora of November 17, 1882 and the May 1921 geomagnetic storm, both with disruption of telegraph service and initiation of fires, and 1960, when widespread radio disruption was reported. GOES-7 monitors the space weather conditions during the Great Geomagnetic storm of March 1989, the Moscow neutron monitor recorded the passage of a CME as a drop in levels known as a Forbush decrease. In early August 1972, a series of flares and solar storms peaks with a flare estimated around X20 producing the fastest CME transit ever recorded and a severe geomagnetic and proton storm that disrupted terrestrial electrical and communications networks, as well as satellites (at least one made permanently inoperative), and unintentionally detonated numerous U.S. Navy magnetic-influence sea mines in North Vietnam. 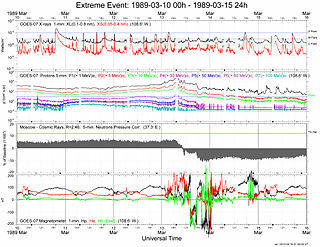 The March 1989 geomagnetic storm caused the collapse of the Hydro-Québec power grid in seconds as equipment protection relays tripped in a cascading sequence. Six million people were left without power for nine hours. The storm caused auroras as far south as Texas. The storm causing this event was the result of a coronal mass ejected from the Sun on March 9, 1989. The minimum of Dst was −589 nT. On July 14, 2000, an X5 class flare erupted (known as the Bastille Day event) and a coronal mass was launched directly at the Earth. A geomagnetic super storm occurred on July 15–17; the minimum of the Dst index was −301 nT. Despite the storm's strength, no power distribution failures were reported. The Bastille Day event was observed by Voyager 1 and Voyager 2, thus it is the farthest out in the Solar System that a solar storm has been observed. Seventeen major flares erupted on the Sun between 19 October and 5 November 2003, including perhaps the most intense flare ever measured on the GOES XRS sensor—a huge X28 flare, resulting in an extreme radio blackout, on 4 November. These flares were associated with CME events that caused three geomagnetic storms between 29 October and 2 November, during which the second and third storms were initiated before the previous storm period had fully recovered. The minimum Dst values were −151, −353 and −383 nT. Another storm in this sequence occurred on 4–5 November with a minimum Dst of −69 nT. The last geomagnetic storm was weaker than the preceding storms, because the active region on the Sun had rotated beyond the meridian where the central portion CME created during the flare event passed to the side of the Earth. The whole sequence became known as the Halloween Solar Storm. The Wide Area Augmentation System (WAAS) operated by the Federal Aviation Administration (FAA) was offline for approximately 30 hours due to the storm. The Japanese ADEOS-2 satellite was severely damaged and the operation of many other satellites were interrupted due to the storm. Magnetosphere in the near-Earth space environment. The solar wind also carries with it the Sun's magnetic field. This field will have either a North or South orientation. If the solar wind has energetic bursts, contracting and expanding the magnetosphere, or if the solar wind takes a southward polarization, geomagnetic storms can be expected. The southward field causes magnetic reconnection of the dayside magnetopause, rapidly injecting magnetic and particle energy into the Earth's magnetosphere. During a geomagnetic storm, the ionosphere's F2 layer becomes unstable, fragments, and may even disappear. In the northern and southern pole regions of the Earth, auroras are observable. Magnetometers monitor the auroral zone as well as the equatorial region. Two types of radar, coherent scatter and incoherent scatter, are used to probe the auroral ionosphere. By bouncing signals off ionospheric irregularities, which move with the field lines, one can trace their motion and infer magnetospheric convection. Electric sensors at the ends of opposing booms are used to measure potential differences between separated points, to derive electric fields associated with convection. The method works best at high plasma densities in low Earth orbit; far from Earth long booms are needed, to avoid shielding-out of electric forces. Radio sounders from the ground can bounce radio waves of varying frequency off the ionosphere, and by timing their return determine the electron density profile—up to its peak, past which radio waves no longer return. Radio sounders in low Earth orbit aboard the Canadian Alouette 1 (1962) and Alouette 2 (1965), beamed radio waves earthward and observed the electron density profile of the "topside ionosphere". Other radio sounding methods were also tried in the ionosphere (e.g. on IMAGE). Particle detectors include a Geiger counter, as was used for the original observations of the Van Allen radiation belt. Scintillator detectors came later, and still later "channeltron" electron multipliers found particularly wide use. To derive charge and mass composition, as well as energies, a variety of mass spectrograph designs were used. For energies up to about 50 keV (which constitute most of the magnetospheric plasma) time-of-flight spectrometers (e.g. "top-hat" design) are widely used. Computers have made it possible to bring together decades of isolated magnetic observations and extract average patterns of electrical currents and average responses to interplanetary variations. They also run simulations of the global magnetosphere and its responses, by solving the equations of magnetohydrodynamics (MHD) on a numerical grid. Appropriate extensions must be added to cover the inner magnetosphere, where magnetic drifts and ionospheric conduction need to be taken into account. So far the results are difficult to interpret, and certain assumptions are needed to cover small-scale phenomena. It has been suggested that a geomagnetic storm on the scale of the solar storm of 1859 today would cause billions or even trillions of dollars of damage to satellites, power grids and radio communications, and could cause electrical blackouts on a massive scale that might not be repaired for weeks, months, or even years. Such sudden electrical blackouts may threaten food production. When magnetic fields move about in the vicinity of a conductor such as a wire, a geomagnetically induced current is produced in the conductor. This happens on a grand scale during geomagnetic storms (the same mechanism also influenced telephone and telegraph lines before fiber optics, see above) on all long transmission lines. Long transmission lines (many kilometers in length) are thus subject to damage by this effect. Notably, this chiefly includes operators in China, North America, and Australia, especially in modern high-voltage, low-resistance lines. The European grid consists mainly of shorter transmission circuits, which are less vulnerable to damage. The (nearly direct) currents induced in these lines from geomagnetic storms are harmful to electrical transmission equipment, especially transformers—inducing core saturation, constraining their performance (as well as tripping various safety devices), and causing coils and cores to heat up. In extreme cases, this heat can disable or destroy them, even inducing a chain reaction that can overload transformers. Most generators are connected to the grid via transformers, isolating them from the induced currents on the grid, making them much less susceptible to damage due to geomagnetically induced current. However, a transformer that is subjected to this will act as an unbalanced load to the generator, causing negative sequence current in the stator and consequently rotor heating. According to a study by Metatech corporation, a storm with a strength comparable to that of 1921 would destroy more than 300 transformers and leave over 130 million people without power in the United States, costing several trillion dollars. The Daily Mail even claims that a massive solar flare could knock out electric power for months, but these predictions are contradicted by a NERC report that concludes that a geomagnetic storm would cause temporary grid instability but no widespread destruction of high-voltage transformers. The report points out that the widely quoted Quebec grid collapse was not caused by overheating transformers but by the near-simultaneous tripping of seven relays. Besides the transformers being vulnerable to the effects of a geomagnetic storm, electricity companies can also be affected indirectly by the geomagnetic storm. For instance, internet service providers may go down during geomagnetic storms (and/or remain non-operational long after). Electricity companies may have equipment requiring a working internet connection to function, so during the period the internet service provider is down, the electricity too may not be distributed. By receiving geomagnetic storm alerts and warnings (e.g. by the Space Weather prediction Center; via Space Weather satellites as SOHO or ACE), power companies can minimize damage to power transmission equipment, by momentarily disconnecting transformers or by inducing temporary blackouts. Preventative measures also exist, including preventing the inflow of GICs into the grid through the neutral-to-ground connection. High frequency (3–30 MHz) communication systems use the ionosphere to reflect radio signals over long distances. Ionospheric storms can affect radio communication at all latitudes. Some frequencies are absorbed and others are reflected, leading to rapidly fluctuating signals and unexpected propagation paths. TV and commercial radio stations are little affected by solar activity, but ground-to-air, ship-to-shore, shortwave broadcast and amateur radio (mostly the bands below 30 MHz) are frequently disrupted. Radio operators using HF bands rely upon solar and geomagnetic alerts to keep their communication circuits up and running. Military detection or early warning systems operating in the high frequency range are also affected by solar activity. The over-the-horizon radar bounces signals off the ionosphere to monitor the launch of aircraft and missiles from long distances. During geomagnetic storms, this system can be severely hampered by radio clutter. Also some submarine detection systems use the magnetic signatures of submarines as one input to their locating schemes. Geomagnetic storms can mask and distort these signals. The Federal Aviation Administration routinely receives alerts of solar radio bursts so that they can recognize communication problems and avoid unnecessary maintenance. When an aircraft and a ground station are aligned with the Sun, high levels of noise can occur on air-control radio frequencies. This can also happen on UHF and SHF satellite communications, when an Earth station, a satellite and the Sun are in alignment. In order to prevent unnecessary maintenance on satellite communications systems aboard aircraft AirSatOne provides a live feed for geophysical events from NOAA's Space Weather Prediction Center. AirSatOne's live feed allows users to view observed and predicted space storms. Geophysical Alerts are important to flight crews and maintenance personnel to determine if any upcoming activity or history has or will have an effect on satellite communications, GPS navigation and HF Communications. Telegraph lines in the past were affected by geomagnetic storms. Telegraphs used a single long wire for the data line, stretching for many miles, using the ground as the return wire and fed with DC power from a battery; this made them (together with the power lines mentioned below) susceptible to being influenced by the fluctuations caused by the ring current. The voltage/current induced by the geomagnetic storm could have diminished the signal, when subtracted from the battery polarity, or to overly strong and spurious signals when added to it; some operators learned to disconnect the battery and rely on the induced current as their power source. In extreme cases the induced current was so high the coils at the receiving side burst in flames, or the operators received electric shocks. Geomagnetic storms affect also long-haul telephone lines, including undersea cables unless they are fiber optic. Damage to communications satellites can disrupt non-terrestrial telephone, television, radio and Internet links. The National Academy of Sciences reported in 2008 on possible scenarios of widespread disruption in the 2012–2013 solar peak. Systems such as GPS, LORAN and the now-defunct OMEGA are adversely affected when solar activity disrupts their signal propagation. The OMEGA system consisted of eight transmitters located throughout the world. Airplanes and ships used the very low frequency signals from these transmitters to determine their positions. During solar events and geomagnetic storms, the system gave navigators information that was inaccurate by as much as several miles. If navigators had been alerted that a proton event or geomagnetic storm was in progress, they could have switched to a backup system. One technology used to allow GPS receivers to continue to operate in the presence of some confusing signals is Receiver Autonomous Integrity Monitoring (RAIM). However, RAIM is predicated on the assumption that a majority of the GPS constellation is operating properly, and so it is much less useful when the entire constellation is perturbed by global influences such as geomagnetic storms. Even if RAIM detects a loss of integrity in these cases, it may not be able to provide a useful, reliable signal. Geomagnetic storms and increased solar ultraviolet emission heat Earth's upper atmosphere, causing it to expand. The heated air rises, and the density at the orbit of satellites up to about 1,000 km (621 mi) increases significantly. This results in increased drag, causing satellites to slow and change orbit slightly. Low Earth Orbit satellites that are not repeatedly boosted to higher orbits slowly fall and eventually burn up. Skylab's 1979 destruction is an example of a spacecraft reentering Earth's atmosphere prematurely as a result of higher-than-expected solar activity. During the great geomagnetic storm of March 1989, four of the Navy's navigational satellites had to be taken out of service for up to a week, the U.S. Space Command had to post new orbital elements for over 1000 objects affected and the Solar Maximum Mission satellite fell out of orbit in December the same year. As technology has allowed spacecraft components to become smaller, their miniaturized systems have become increasingly vulnerable to the more energetic solar particles. These particles can physically damage microchips and can change software commands in satellite-borne computers. Another problem for satellite operators is differential charging. During geomagnetic storms, the number and energy of electrons and ions increase. When a satellite travels through this energized environment, the charged particles striking the spacecraft differentially charge portions of the spacecraft. Discharges can arc across spacecraft components, harming and possibly disabling them. Earth's magnetic field is used by geologists to determine subterranean rock structures. For the most part, these geodetic surveyors are searching for oil, gas or mineral deposits. They can accomplish this only when Earth's field is quiet, so that true magnetic signatures can be detected. Other geophysicists prefer to work during geomagnetic storms, when strong variations in the Earth's normal subsurface electric currents allow them to sense subsurface oil or mineral structures. This technique is called magnetotellurics. For these reasons, many surveyors use geomagnetic alerts and predictions to schedule their mapping activities. Rapidly fluctuating geomagnetic fields can produce geomagnetically induced currents in pipelines. This can cause multiple problems for pipeline engineers. Pipeline flow meters can transmit erroneous flow information and the corrosion rate of the pipeline is dramatically increased. If engineers incorrectly attempt to balance the current during a geomagnetic storm, corrosion rates may increase even more. Pipeline managers thus receive space weather alerts and warnings to allow them to implement defensive measures. Intense solar flares release very-high-energy particles that can cause radiation poisoning. Earth's atmosphere and magnetosphere allow adequate protection at ground level, but astronauts are subject to potentially lethal doses of radiation. The penetration of high-energy particles into living cells can cause chromosome damage, cancer and other health problems. Large doses can be immediately fatal. Solar protons with energies greater than 30 MeV are particularly hazardous. Solar proton events can also produce elevated radiation aboard aircraft flying at high altitudes. Although these risks are small, monitoring of solar proton events by satellite instrumentation allows the occasional exposure to be monitored and evaluated and eventually flight paths and altitudes adjusted in order to lower the absorbed dose of the flight crews. Scientists are still studying whether or not animals are affected by this, some suggesting this is why whales beach themselves. Some have stated the possibility that other migrating animals including birds and honey bees, might be affected since they also use magnetoreception to navigate, and geomagnetic storms alter the Earth's magnetic fields temporarily. ^ a b "Scientists probe northern lights from all angles". CBC. 22 October 2005. ^ a b "Earth dodges magnetic storm". New Scientist. 24 June 1989. ^ S. Chapman; V. C. A. Ferraro (1930). "A New Theory of Magnetic Storms". Nature. 129 (3169): 129–130. Bibcode:1930Natur.126..129C. doi:10.1038/126129a0. ^ V. C. A. Ferraro (1933). "A New Theory of Magnetic Storms: A Critical Survey". The Observatory. 56: 253–259. Bibcode:1933Obs....56..253F. ^ a b Gonzalez, W. D., J. A. Joselyn, Y. Kamide, H. W. Kroehl, G. Rostoker, B. T. Tsurutani, and V. M. Vasyliunas (1994), What is a Geomagnetic Storm?, J. Geophys. Res., 99(A4), 5771–5792. ^  Sugiura, M., and T. Kamei, Equatorial Dst index 1957–1986, IAGA Bulletin, 40, edited by A. Berthelier and M. Menville, ISGI Publ. Off., Saint. Maur-des-Fosses, France, 1991. ^ Cander, L. R.; Mihajlovic, S. J. (1998-01-01). "Forecasting ionospheric structure during the great geomagnetic storms". Journal of Geophysical Research: Space Physics. 103 (A1): 391–398. Bibcode:1998JGR...103..391C. doi:10.1029/97JA02418. ISSN 2156-2202. ^ Russell, Randy (March 29, 2010). "Geomagnetic Storms". Windows to the Universe. National Earth Science Teachers Association. Retrieved 4 August 2013. ^ Tsurutani, B. T.; Gonzalez, W. D.; Lakhina, G. S.; Alex, S. (2003). "The extreme magnetic storm of 1–2 September 1859" (PDF). J. Geophys. Res. 108 (A7): 1268. Bibcode:2003JGRA..108.1268T. doi:10.1029/2002JA009504. ^ "Bracing the Satellite Infrastructure for a Solar Superstorm". Sci. Am. ^ Knipp, Delores J.; B. J. Fraser; M. A. Shea; D. F. Smart (2018). "On the Little‐Known Consequences of the 4 August 1972 Ultra‐Fast Coronal Mass Ejecta: Facts, Commentary and Call to Action". Space Weather. 16 (11): 1635–1643. doi:10.1029/2018SW002024. ^ "Geomagnetic Storms Can Threaten Electric Power Grid". Earth in Space. 9 (7): 9–11. March 1997. Archived from the original on 2008-06-11. ^ Webber, W. R.; McDonald, F. B.; Lockwood, J. A.; Heikkila, B. (2002). "The effect of the July 14, 2000 "Bastille Day" solar flare event on >70 MeV galactic cosmic rays observed at V1 and V2 in the distant heliosphere". Geophys. Res. Lett. 29 (10): 1377–1380. Bibcode:2002GeoRL..29.1377W. doi:10.1029/2002GL014729. ^ Snare, Robert C. "A History of Vector Magnetometry in Space". University of California. Retrieved 2008-03-18. ^ a b "A Perfect Storm of Planetary Proportions". IEEE Spectrum. February 2012. Retrieved 2012-02-13. ^ Severe Space Weather Events: Understanding Societal and Economic Impacts : a Workshop Report. Washington, D.C.: National Academies, 2008 Web. 15 Nov. 2011. Pages 78, 105, & 106. ^ "Massive solar flare 'could paralyse Earth in 2013'". The Daily Mail. September 21, 2010. ^ "AirSatOne – Geophysical Alerts Live Feed". ^ "Solar Storms Could Be Earth's Next Katrina". Retrieved 2010-03-04. ^ Severe Space Weather Events—Understanding Societal and Economic Impacts: Workshop Report. Washington, D.C: National Academies Press. 2008. ISBN 978-0-309-12769-1. ^ Gummow, R; Eng, P (2002). "GIC effects on pipeline corrosion and corrosion control systems". Journal of Atmospheric and Solar-Terrestrial Physics. 64 (16): 1755. Bibcode:2002JASTP..64.1755G. doi:10.1016/S1364-6826(02)00125-6. ^ Osella, A; Favetto, A; López, E (1998). "Currents induced by geomagnetic storms on buried pipelines as a cause of corrosion". Journal of Applied Geophysics. 38 (3): 219. Bibcode:1998JAG....38..219O. doi:10.1016/S0926-9851(97)00019-0. ^ Council, National Research; Sciences, Division on Engineering and Physical; Board, Space Studies; Applications, Commission on Physical Sciences, Mathematics, and; Research, Committee on Solar and Space Physics and Committee on Solar-Terrestrial (2000). Radiation and the International Space Station: Recommendations to Reduce Risk. National Academies Press. p. 9. ISBN 978-0-309-06885-7. ^ "Evaluation of the Cosmic Ray Exposure of Aircraft Crew" (PDF). ^ "Scientist studies whether solar storms cause animal beachings". ^ McGrath, Matt (5 September 2017). "Northern lights link to whale strandings" – via www.bbc.com. Bolduc, L. (2002). "GIC observations and studies in the Hydro-Québec power system". J. Atmos. Sol. Terr. Phys. 64 (16): 1793–1802. Bibcode:2002JASTP..64.1793B. doi:10.1016/S1364-6826(02)00128-1. Campbell, W.H. (2001). Earth Magnetism: A Guided Tour Through Magnetic Fields. New York: Harcourt Sci. & Tech. ISBN 978-0-12-158164-0. Davies, K. (1990). Ionospheric Radio. IEE Electromagnetic Waves Series. London, UK: Peter Peregrinus. pp. 331–345. ISBN 978-0-86341-186-1. Eather, R.H. (1980). Majestic Lights. Washington DC: AGU. ISBN 978-0-87590-215-9. Garrett, H.B. ; Pike, C.P., eds. (1980). Space Systems and Their Interactions with Earth's Space Environment. New York: American Institute of Aeronautics and Astronautics. ISBN 978-0-915928-41-5. Harding, R. (1989). Survival in Space. New York: Routledge. ISBN 978-0-415-00253-0. Joselyn J.A. (1992). "The impact of solar flares and magnetic storms on humans". EOS. 73 (7): 81, 84–5. Bibcode:1992EOSTr..73...81J. doi:10.1029/91EO00062. Johnson, N.L. ; McKnight, D.S. (1987). Artificial Space Debris. Malabar, Florida: Orbit Book. ISBN 978-0-89464-012-4. Lanzerotti, L.J. (1979). "Impacts of ionospheric / magnetospheric process on terrestrial science and technology". In Lanzerotti, L.J. ; Kennel, C.F. ; Parker, E.N. Solar System Plasma Physics, III. New York: North Holland. Odenwald, S. (2001). The 23rd Cycle:Learning to live with a stormy star. Columbia University Press. ISBN 978-0-231-12079-1. Odenwald, S., 2003, "The Human Impacts of Space Weather".